Those who have found themselves or a loved one admitted to a hospital emergency room have likely been asked whether they have an advanced directive. Most people do not, unfortunately. Not having an advanced directive can lead to unnecessary family stress and confusion at a time that is already difficult. If you suffer a serious injury and need emergency care, or if you are suffering from a serious medical condition, it is likely that very important medical decisions will need to be made. However, if you do not have the capacity to answer those questions and make important decisions about health care, having advanced directives will make all the difference in the world. Estate planning and incapacity planning should involve more than just your last will and testament and a trust. Having advanced directives in place prove important in many different situations, and you have many different options. This article will discuss the option of creating a living will as an advanced directive. 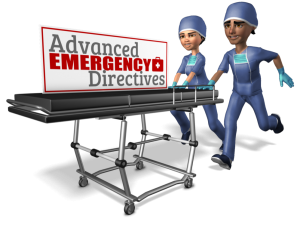 First, What are Advanced Directives? Advanced directives are the instructions you provide ahead of time about the type of medical treatment or end-of-life care you want to be provided to you, when necessary. These documents will speak for you in the event you are unable to make those decisions or voice your desires at the time when you need treatment. Having advanced directives drawn up ahead of time takes the pressure off of your family and the health care professionals if they need to make medical decisions for you. How Does the Living Will Work? A living will is one of the many advanced directives that are available. When you use a living will to address certain medical concerns, it serves as an advanced directive for health care. Some advanced directives simply allow you to designate a proxy to serve as your decision maker in terms of your medical care. The living will, on the other hand, describes your own decisions regarding medical treatment and end-of-life care. Remember, a living will does not address ongoing health care decisions – only those that involve life-saving or life-sustaining care. Most people don’t have living wills because many people don’t understand what they are. It’s too easy to confuse these documents for the more traditional Last Will, but the two documents couldn’t be more different in nature or effect. Your Last Will is an estate planning tool and the most commonly used method for families who create plans to distribute assets when a testator dies. The living will, on the other hand, does nothing of the kind. It doesn’t deal with assets or even legacy concerns. It has one role — to express your sentiments about the types of life-sustaining treatment you are willing to receive when you are at death’s door. Of course, there is a wide range of treatments that can be covered by a living will. Your living will should provide instructions about various medical treatments and procedures. Here are some examples that our Ashland estate planning attorney has included for clients. Blood transfusions can be an especially delicate subject for some religious sects, as there are certain religions that forbid the use of blood transfusions – even in life-threatening situations. If you’re incapacitated and need dialysis treatment, your living will can also help medical personnel know whether you want to receive that treatment. Some people don’t want to be resuscitated if they stop breathing or their hearts stop beating. Those wishes can only be respected if they’re made clear prior to the emergency, and are often included as part of a DNR (Do-Not-Resuscitate) order. If surgery is required to resuscitate you or sustain your life in some other way, it’s important for doctors to know your feelings on the subject. If you have questions regarding living wills or any other estate planning matters, please contact the experienced attorneys at The Potter Law Firm for a consultation. You can contact us either online or by calling us at (606) 324-5516 (Ashland, KY) or at (859) 372-6655 (Florence, KY) or for individuals in North Carolina, at (704) 944-3245 (Charlotte, NC or Huntersville, NC).